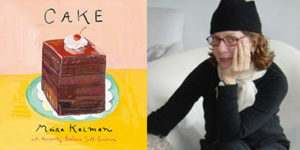 With great style, wit, and joy, Maira Kalman and Barbara Scott-Goodman have collaborated to celebrate their favorite dessert in CAKE, published by Penguin Press. Kalman’s enchanting illustrations, in her inimitable style, and Scott-Goodman’s mouthwatering recipes complement each other perfectly, making CAKE a whimsical celebration of a timeless dessert. On Sunday, May 6, meet up with Maira at the Brooklyn Public Library for a “Square Dance Sunday Book Signing, featuring CAKE and Max the Dog.” And don’t worry, there will be plenty of cake!